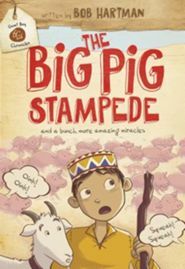 In The Big Pig Stampede, a boy named Gideon who is affectionately nicknamed the goat boy, manages to be a witness to the miracles of Jesus we read about in the New Testament. He is unaware of their significance, but they seem to be greatly impacting his life. Gideon and his friend Bug have so many adventures in this book, from helping lower a sick many through a roof to seeing Jesus feed a multitude. Author Bob Hartman does such a great job of captivating my sons’ attention with his writing. Elementary age boys are a tough audience! My two have asked questions, or been excited to hear a story they know well retold from a witness perspective. I would say that this book is likely to please any boy, or girl for that matter, from age 6 to 10. We will be following the series and will be looking forward to the next book in the Goat Boy Chronicles! Thank you Bob Harman for writing something I can let my boys read! I was given a complimentary copy of this book to review in exchange for my honest opinion. I have not been compensated in any way. All opinions are my own.